Due to using the wrong footprint on the PCB, however, the USB feature (to be implemented by an Arduino Pro Mini) needs some “creative” way to connect the Pro Mini! The schematic really is very simple. There is an 8 x 5 matrix laid out in a 4 x 10 pattern. These go via 8 diodes to an 8 and 5 way connector. If you are using this with an old retro computer, or doing your own decoding, this is all you need. These row and column pins also extend to an Atmel ATMEGA328 (Arduino Uno) socket and an incorrectly sized Arduino Pro Mini footprint. The ‘328 needs a clock circuit consisting of a couple of 22pf capacitors and 16Mhz crystal, and a reset circuit with 10K resistor, 100nf capacitor and reset switch. There is a 6 pin programming headers which also works as the serial output. 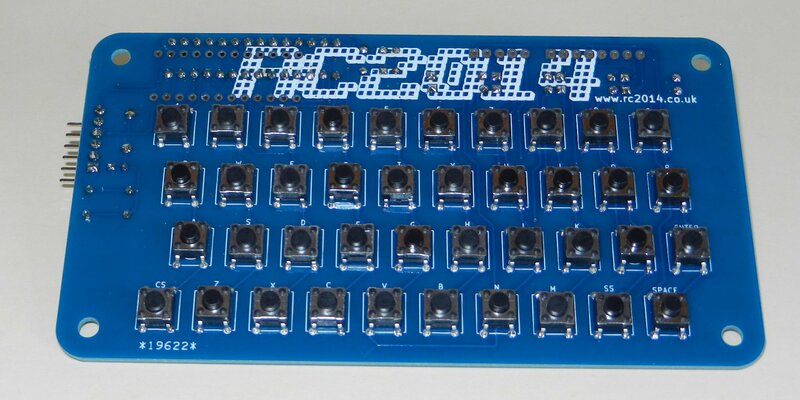 If connecting to an RC2014, you will only need to connect pins 1,3& 5 (Gnd, 5v & Tx) of the keyboard to pins 17, 18 & 38 of the RC2014 backplane, or to pins 1, 3 & 4 of the Serial I/O board. If using a Pro Mini to connect to a PC, laptop or tablet, you will just need to connect a USB cable between the Pro Mini and your device. The code is available on Git Hub (https://github.com/semachthemonkey/RC2014-Keyboard). This code currently supports 2 modifier keys so each key has 3 functions – typically lowercase, uppercase and a symbol. The baudrate and keyboard layout are easily modifiable if you wish to do so.